Kids' Book Review: Review: What is a Crocodile's Favourite Thing? 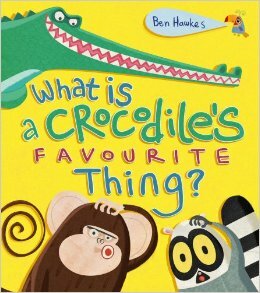 Review: What is a Crocodile's Favourite Thing? Vibrant, colourful and SO MUCH FUN! What is a Crocodile's Favourite Thing? is a great book to read to a group of kids of varying ages (think sibling story time) as there are different elements of both the text and illustrations that will appeal to a broad age range, from 1 through to 8 or 9. Focusing on inflection is very important in the reading of this story, otherwise it can come across as stilted or can get a bit confusing. However, certain words throughout the text are in bold to highlight where exaggeration and emphasis are required, helping the reader to draw the kids in, elicit their cries of "NO!" and get them excited to see what (or who) exactly is a crocodile's favourite thing. This picture book is a great resource for promoting visual literacy, a large portion of the story is told exclusively through the illustrations. While this may be a little bit lost on the really young participants, older kids will delight in 'reading' the illustrations and figuring out what is going to happen. "This is a very silly book. Reading this book may cause silliness, more silliness, and in some cases, your bottom may drop off". I am quite pleased to report however, that mine did not. Title: What is a Crocodile's Favourite Thing?